Custom Designed Websites Offered by iNET image, inc.
All of our website packages offer a custom configured website with the iNET RealTime Content Management System, however, some businesses require more. The possibilities of look, functionality and features are endless. If your business requires custom features let our professional design and create them for you. Below are some examples. STEDF.org features numerous data management and display features. The site makes use of several RealTime optional features such as our Gallery, Calendar, and of course the Brochure CMS system which manages content on 50 or more web pages. In addition customer news and upcoming events scrollers bring attention to important time sensitive information. 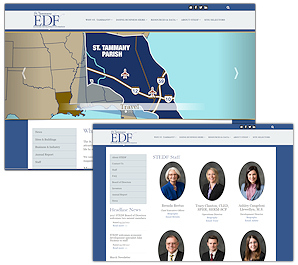 Other features include custom data system to handle requests for site location assistance and integrated St. Tammany and Louisiana Commercial third party databases. 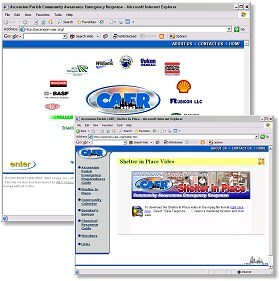 www.Ascension-Caer.org is a community awareness website which features a custom data system to display emergency information about chemicals produced by various companies located in Louisiana's Ascension Parish. This system gives the association's experts the ability to add and update vital information and emergency procedures. The site also includes a custom designed member's section to facilitate communication and share timely information of the members. Other custom features include Speaker's Bureau, a mobile view website, Shelter in Place guide and more. 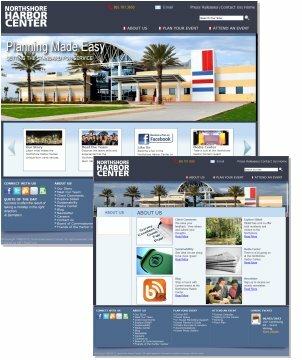 www.NorthshoreHarborCenter.com features a dynamic design with many custom display features. Scrolling upcoming events, quote of the day, customer comments are all dynamic features that are manageable by in-house personal. The Harbor Center has an active Facebook presence. We created several custom apps to display website content in Facebook. The site also includes the Mobile web feature. The site makes use of the photo gallery, calendar of events and of course the Brochure which they use to manage numerous webpages. Toll Free 1(985) 643-4555 between 9 a.m. and 5 p.m. CST, Monday - Friday.